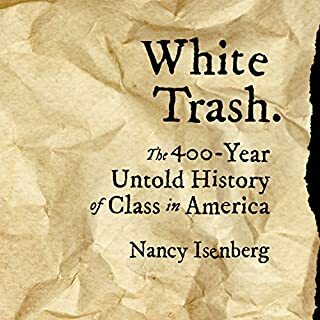 In White Trash, Nancy Isenberg upends assumptions about America's supposedly class-free society. Poor whites were central to the rise of the Republican Party in the early 19th century, and the Civil War itself was fought over class issues nearly as much as it was fought over slavery. Reconstruction pitted poor white trash against newly freed slaves, which factored in the rise of eugenics. These poor were at the heart of New Deal reforms and LBJ's Great Society; they haunt us in reality TV shows like Here Comes Honey Boo Boo and Duck Dynasty. From the African American perspective, I was drawn to this book by it's mere title. By the end of the first chapter I found myself engrossed in the historical foundation of America's diabolical institutions of race and class. Quite astoundingly, I was amazed to discover that social Darwinism has not only been relegated to race although it has been known to me and my fellow humans of the Black race, that all are guilty of holding onto family and regional pride. What does seem to be inevitable in these days of "occupiers" and "All Lives Matter", Equality here and there is...nothing will change. What has been confirmed for me is that human nature is so deeply ingrained that what seems to be rigged, is rigged indeed.